Whatever power supply you use, make sure it does not overshoot the desired voltage for an instant when you turn it on, as that could damage the ICs in the computer you just made. (I mention this because I've seen some integrated switching regulators that do overshoot upon turn-on.) Also, if it is adjustable, make sure you verify the correct voltage before powering the computer up, unless the computer has its own 5V regulator. 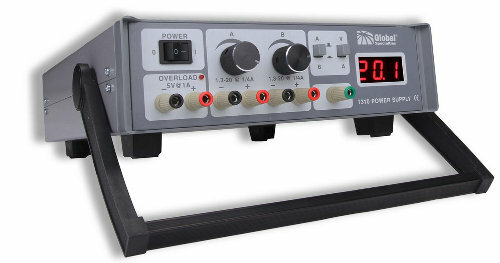 You will also need a decent DMM (digital multimeter). Actually, it doesn't particularly need to be digital, but most of them today are, and I've never seen an analog one with capacitance tester, frequency counter, transistor tester, diode test, or beep-on-continuity which come pretty standard on mid-range DMMs. The analog ones generally are not as sensitive either. You don't have to spend $100, let alone $400, but $25 probably is not enough. There are plenty of good ones starting at $40-$60. Go to Jameco's (or other distributor's) website and put "DMM" in the search bar. I'm still using a Metex M-3650 I bought from Jameco in the 1980's, and operationally it seems to still be in brand-new condition. An oscilloscope is not an absolute necessity, but it's awfully good to have. If you can afford one, then it's a necessity! :D Basic new ones seem to start around $350. It needs to be at least dual-trace, triggered, and 20MHz. Basic stand-alone 'scopes now seem to meet all of those, in fact start at 40MHz or more which is good. Pocket digital ones made for audio probably will not do you much good for your home-made-computer hobby. One thing I will insist on is that you get a good pair of probes, and use them in the x10 switch position. In the x10 position, the oscilloscope's .1V-per-division setting becomes 1V per division, and so on; but probes are never any good for the higher speeds in the x1 position! If you buy a new 'scope, it will come with probes. Take care of them, because they're not cheap to replace. There's a lot more to good probes than meets the eye, and a decent pair for a low-end oscilloscope will cost you at least $40 or $50. (They can be many times that price for the faster 'scopes!) If you get a used 'scope, either be sure you get good probes with it, or budget some money to buy some. Dave Jones has a rant about oscilloscopes on his EEVBlog #86, and frankly, he's right. His basic message in this one is that cheap 'scopes like the DSO Nano are worthless; and after seeing his review of it, I totally agree! His recommendation—actually his pleading, after all the times he's been asked about the cheapie 'scopes—is that if you're on a tight budget, then get yourself a used, basic 20MHz dual-trace triggered oscilloscope which you can sometimes even get for free these days. I came across this video review of an oscilloscope attachment and ap for the iPad or iPhone on EEWeb, which I mention because like so many of these that seem to be a nice shortcut way to get something we used to have to pay a lot more for, they say it's very nice to use but its technical specifications are very poor, with only one analog channel, 5MHz bandwidth, 500mV/div with the probe on x10, and a 240-sample screen, which are not adequate for the work we're addressing in this 6502 primer. A logic probe is cheap but not very often useful. I've never had one, but it wouldn't hurt to get one if you want to, especially if you don't get an oscilloscope. Dave Jones has a video blog on setting up an electronics lab, at https://www.youtube.com/watch?v=R_PbjbRaO2E. I posted about it on the sparkfun forum in response to someone's question, and the OP said he didn't think he would need 90% of that stuff. But like Dave said near the end, a lot of that stuff gets accumulated slowly over the years. He discusses the very basics at the beginning though, and I definitely agree with most of it. I've seen here where beginners really cause themselves a lot of trouble and frustration by not getting for example a good DMM and power supply like Dave talks about, and a basic 20MHz dual-trace, triggered analog oscilloscope. Without an oscilloscope, you're kind of working in the dark. It's far more important than some of the things (like simulators) that beginners think they need.